« Merry Christmas: The 2013 edition! 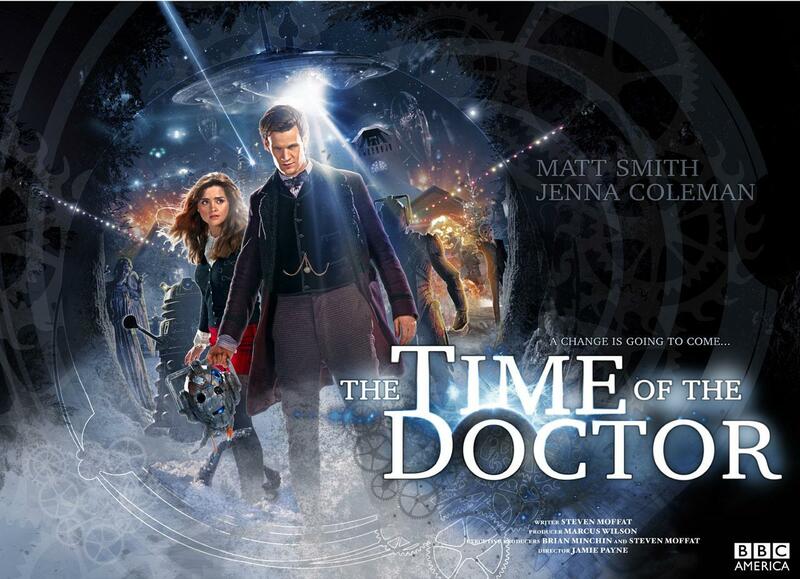 Review: Time of the Doctor – The 2013 Christmas Special. Probably as anticipated as the 50th anniversary, the 2013 Doctor Who Christmas special has been on the lips of every Whovian ever since Matt Smith announced that he was indeed stepping down from the role of The Doctor. No one know what to expect this year, but, here it is, the day after the Christmas special, and every social media is filled with warm and loving good-byes for Matt Smith, and hardly any welcomes for Peter Capaldi that I have seen. My thoughts on the Christmas special were mixed. It was good overall. A nice peace of science fiction. We get to see the Doctor’s age catch up with him, we get to see him make a new home for himself for the first time since he left Gallifrey, and we get to see him accepting the fact that he thought he was never going to be able to leave the town called Christmas. All of this was well acted by Matt Smith. We also get to see the Doctor torn between two decisions. Gallifrey is sending a signal through one of the few remaining cracks in reality, asking for the Doctor to speak his true name to make sure that they have the right “spot,” and if he does, Gallifrey will return to our universe. but, if that does happen when every enemy the Doctor has ever made is in orbit of the planet which is the source of the signal, which we later find out is Trenzalore, then war will break out as every ship will open fire on the newly returned Gallifrey. But, one thing about this bothers me. It basically sounds like that Gallifrey will take the place of Trenzalore; a planet with an fixed place in time as it is the final resting place of the Doctor. So, would Gallifrey replace Trenzalore? That would be the only way that all of the orbiting ships could open fire on Gallifrey when it got back. And if that would have happened, then that would have changed history, not only for the Doctor, but for Clara and just about every adventure that the Doctor ever had. Remember the episode “The Name of the Doctor” where Clara jumped into the Doctors life stream and became the impossible girl? Once Mother Superior of the Papal Mainframe makes it clear that if Gallifrey does indeed return that the Time War will begin again, and that they will do everything they can to make sure that doesn’t happen again, the Doctor takes it upon himself to protect the town of Christmas as well as Gallifrey. For 300 years, the Doctor stood as the guardian of Christmas, defending the village and the people and Gallifrey from his enemies. 300 years in the same place. The Doctor made a home for himself. And after 300 years, the TARDIS returned from taking Clara back home, but Clara was holding onto the TARDIS, so re returned as well. In the end, Clara once again saved the Doctor by convening the Council of the Time Lords (through the crack in the wall) to help the Doctor. They did this by sending regeneration energy through the crack, thus kicking in an extra regeneration, healing the Doctors body. The Doctor stopped a Dalek assault by expelling regeneration energy out from his body, thus destroying the Dalek assault ship and all surrounding Daleks, thus, literally, saving Christmas. The Doctor mentioned that this time around, the regeneration was taking a little bit longer than normal, but when he does finally change, it is a very quick one, literally happening in a flash. I giggled when I heard this line! It was a nice through back to the 1996 movie featuring the Eighth Doctor. The Eighth Doctor suffered from temporary amnesia from his regeneration, but eventually remembered everything. If this wasn’t intentional, I still enjoyed it. Though this Christmas special was good, I also kind of didn’t like it. I felt that it lacked a significant amount of substance. Yes, we got to see the Doctor in a situation that he hasn’t been in before, and we get to see him torn between hope and duty, but the entire story line felt rushed. I felt that they had to quickly wrap up the script and left out a lot. Maybe I’m just spoiled by the 50th Anniversary, or maybe Moffat is losing his touch (which appears to be a popular consensus on the interwebs), but it was just lacking to me. I’m also personally thankful that Steven Moffat FINALLY found a solid opinion on the whole regeneration thing. The explanation that was spoken between the Doctor and Clara was a massively welcomed explanation simplified! Debunking a lot of theories on the whole “it didn’t count because of his name” thing, which was also explained in a way that you can not argue about it. So, there we have it! Eleven in name only! The Doctor himself has established that the numerical sequencing is solely based on his name. A small number of Whovians got it right. I, myself, was just waiting on established canon to tell me so. In all, the Christmas special was just “OK” in my opinion. It answered a lot of questions, brought back a little hokey, gave us a new Doctor, which I’m looking forward to seeing in action as I think he will bring back a lot of the Old School Who spirit, if Moffat will let him, and showed us that Human holidays can be names of villages, and not just islands. Why a severed Cyberman head and not K-9? Review: Time of the Doctor – The 2013 Christmas Special. by The Uncommon Geek is licensed under a Creative Commons Attribution-NonCommercial-ShareAlike 4.0 International License. Based on a work at http://uncommongeek.com.